My dear sweet friend Thao (who I've known since 6th grade!) travelled to Venice, Italy during her semester of studying abroad in Paris, France (how amazingly cool is that?!?) and brought me back a very thoughtful gift: a colorful stone necklace. It was not until recently while we were having dinner when I discovered where the necklace actually originated from. Crazy but the whole time I've had it (and it's been well over 6 years), I've always thought she gave it to me after coming back from Vietnam. 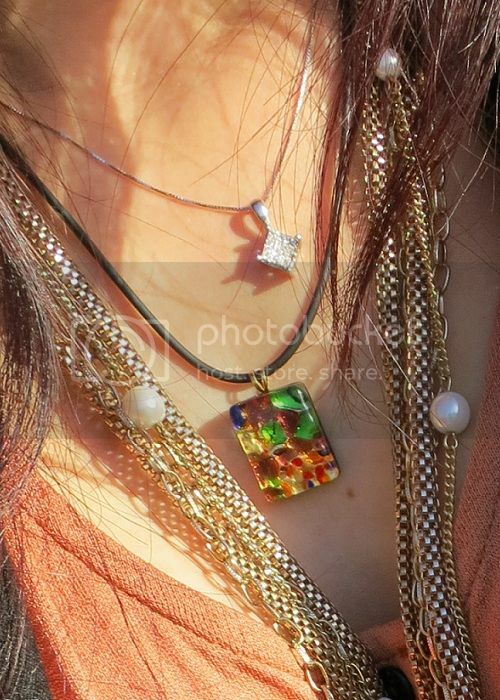 When I mentioned this, Thao looked at me and explained with great enthusiasm (she likes talking loud with excitement) that "it was a glass-blown necklace from the local artists in Venice not Vietnam...Venice, Italy not LA." Oops! I have a bad memory about those kind of little details. Thank goodness I have great friends to remember for me! Another funny side note: yesterday I happen to be watching the Dr. Oz show at 3am (no wonder I want naps after work huh? I'm telling you it's this late night owl in me right now. Hopefully I can resume back to normal sleeping patterns soon.). One of the topics on the show was improving your memory by incorporating beets, cashews, and avocados into your weekly diet. I don't really eat much of any of those, except the occassional avocado (does guacamole count? ), so I guess I'm going to have to try out this method and see if it works. They said to start eating them about two times a week and you'll feel more alert after the second or third week. Okay, sounds easy right? Let's go! That outfit is adorable, specially the skirt ;) I think I saw that show a few days ago. And the truth is that when I ate more cashews I forgot less about things than I do now! haha what a cute story about the necklace! all the different colours are very pretty too. ooh and thanks for the tip! my memory is pretty bad so I might actually try this out haha. I love avocados but not so much cashews and beets...hmm we'll see if this works lol! anywhoz loved this blog n loved the story that's exactly how it all went down btw hehe when we were eating at sakura. I'm the infamous Thao btw. Anywhoz yeah loved avocados! But I heard they are high in cholesterol so increased memory but risk of blood clots n heart attack haha pros n cons I guess... Well this comment better get posted or else I give up.